E-mail: winstongrammar@comcast.net Phone: (360) 687-0282 Fax: (360) 666-2511 Precious Memories Educational Resources 18403 NE 111th Avenue Battle Ground, WA 98604 Three Levels of Learning make it easy to teach your child or students [Each kit mentioned below contains the material for one student. If teaching more than one student, a package for each one will be necessary. ] By Joseph Grayhaim Grammar is the most important skill a literate person can master. Reading, spelling and writing come first, then grammar. But it is also the most daunting of those early language arts skills to teach and learn. Winston Grammar has developed a unique approach to grammar that will make it much easier and even enjoyable for both teacher and student. The Basic Level (6 items) This package covers the most-used parts of speech – nouns, verbs, adverbs, adjectives, direct address, etc. There is a pre-test, which functions as a placement test if the child has already had some grammar instruction. The Basic Level consists of 30 worksheets, four quizzes and a final test. Included in the Basic are a Teacher’s Manual, Student Workbook and a set of 42 small and 8 large, color-coded cards each with the name of a part of speech. The student is given a sentence and then places the correct colored card beneath each word in the sentence. This process is effective for all learning styles, since it involves cards of different colors, placing the cards beneath the sentence, etc. All 6 items can be purchased separately or as a package that comes in a Velcro-closing case. This method makes learning faster and easier than other approaches to grammar. Word Works (2 items) This is the next level in Winston’s program. It applies the grammar concepts that were learned in the Basic Level to writing. It covers the five most-common usage errors in English. A few of the five are: Subject-verb agreement, Personal Pronoun functions, Comparatives & Superlatives, and troublesome words, like good/well, less/fewer, etc. The student need not have completed Winston’s Basic Level, but merely must have learned the same basic concepts. Word Works includes 40 worksheets with a pre-test and a post-test and four quizzes, a Teacher’s Manual, Student Workbook and the first five large cards from the Basic Level Grammar Program to be used for review. 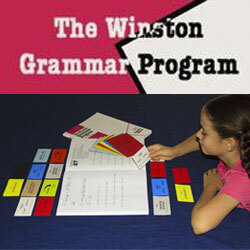 Advanced Level The third level of Winston’s grammar program is the Advanced, which begins with a review of the basic information and then covers possessive nouns, pronouns and adjectives; reflexive verbs, interrogatory pronouns and the other elements of advanced grammar material. This package includes a pre-test for placement purposes, 55 Worksheets, 4 quizzes scattered throughout the program, and a post-test. There is also a Teacher’s Manual, Student Workbook and a set of color-coded cards in a Velcro-sealed case. If the homeschooling parent or classroom teacher wants to remove the anxiety from teaching and learning this most-important subject, please visit Winston Grammar’s website and consider their complete program for achieving mastery of grammar. J.G.